“Wow, this gives me the same kind of feelings I got when I started playing The Witness,” I said as I played the tutorial for Manifold Garden in Sony’s E3 booth. “Really? Good!” I looked over to see William Chyr himself standing there, watching me playing his game. Chyr is a brilliant mind, and just by talking to him you can see how clever he is; how he sees the world upside down and sideways, in a more creative manner than those around him. Yet he’s humble and easy to talk to, open to feedback, and just wanting to make sure that players are finding enjoyment in his game. Once upon a time, Manifold Garden was called Relativity. If you want to read about the fascinating reason for the change, check it out on William Chyr’s site here. The game has gone through an immensely long process of revisions and changes to become the game that it is today. In fact, we’ve previewed it back before the name change, at last year’s E3, where it won one of our Best of E3 awards. 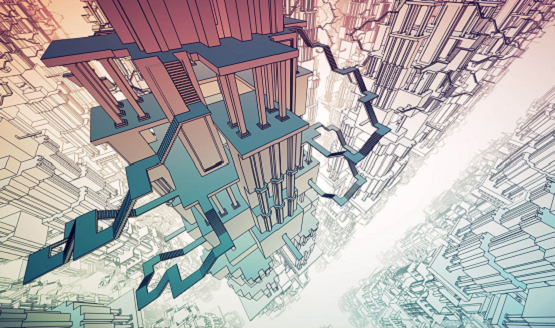 Manifold Garden’s core concept is the use of gravity to solve puzzles and navigate areas that resemble an M.C. Escher painting. By facing a wall and pressing the trigger, gravity shifts to that particular direction, and the color of surface changes to indicate that gravity is now going that way. The early tutorial puzzles didn’t feel too easy but also evoked a sense of brilliant accomplishment as I made it from each room to the next. As I commented to Chyr himself, it really reminded me of The Witness. The game has purpose and direction. It doesn’t hold your hand, but it doesn’t waste time with frivolities either. Everything has meaning and teaches the player to think differently, adapting them to future puzzles which may combine and twist the mechanics, but also within the established rules of the puzzle world. If you read my review of The Witness, you’ll know that’s one of the most crucial aspects to a successful puzzle game. After getting outside of the initial tutorial rooms, I was met with a massive and intimidating open world, which isn’t so intimidating once you know the secret behind it. 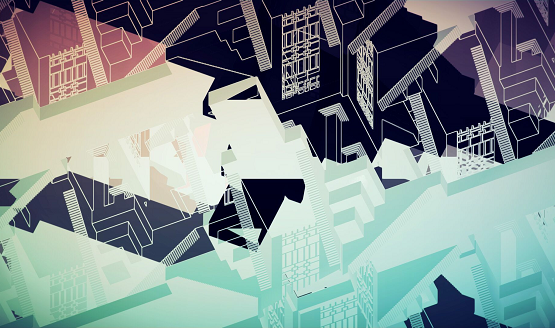 The entire world of Manifold Garden is repeated. Each shape you see in the distance is a repeated instance of the area that you are on. Fall off the world and you’ll land back where you are. Drop a box off the edge and look up. You’ll see it looping back around. Chyr describes it on his blog as a 3D model standing on a 4D shape which wraps in on itself in a mind-bending four-dimensional torus. It’s near impossible to wrap your brain around the physics of it, but it works, and in many cases is the key to solving the puzzles at hand, in addition to changing the direction of gravity in order to play with the world to your advantage.I was also shown a few levels further into the game that bring new mechanics to the table such as water flow (which is trippy in a loop world) and using cubes to grow trees. The M.C. Escher inspired visuals and Witness-like puzzles are enough to keep me excited for Manifold Garden’s full release, but a few other details have me chomping at the bit as well. Chyr showed me the photo mode in the game, which allows you to use the environment and take your own Escher-like shots. Why should games like Uncharted 4 get to have all the fun with photo mode? There are a bunch of different effects that can be applied to really make these captures awesome looking. I love when developers are comfortable enough with what they’ve created to allow players to scrutinize their work and use it to create their own works of art. The kind of capture possible with Manifold Garden’s photo mode. If you like puzzle games, Manifold Garden will be one that you’ll want to keep your eye on. And if you’re at all curious about the process of game development, and want an eye opening look into what it takes to make a game, squash bugs, wrestle with creative quandaries, and just decide what aspect to work on next, I highly recommend reading Williams Chyr’s blog. It’s like being a fly on the wall of the whole development process; a rare look that we don’t often get to see with games.